Victoria Beckham (right) has instagrammed rather gushingly about Alexandra Shulman's book. 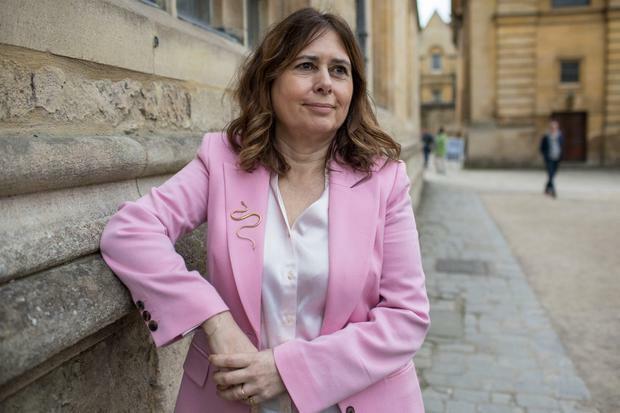 Alexandra Shulman, the former editor-in-chief of British Vogue, has started a body confidence conversation with a bikini selfie. The columnist and author (59), who was at the helm of the style bible for 25 years before announcing her resignation in January, is being praised for posting a picture of her 'bikini body' on holiday in Greece with the simple caption, "Time for the boat". There's no "brave" or "inspiring" caption alongside the pic, but the fact that Shulman has a body more in line with her readers than the super skinny models she featured in Vogue for decades, has earned her new legions of fans. The mother-of-one reveled back in 2009 that she doesn't stress about hitting the beach and her only pre-summer preparation is a good pedicure. "My chosen method of preparation for the great summer unveiling is to have a really good pedicure, so that my toes are ready to greet the fresh air for the first time this year, with a little help from three layers of Butter's coral-coloured Macbeth varnish," she wrote in a column for the Daily Mail. "I am comfortable in my body. I don't think it's particularly great, but it doesn't bother me hugely and makes me realise that being comfortable with your figure has relatively little to do with how you actually look. "Perhaps I've been lucky enough to be surrounded by men who have been very appreciative of it, educated enough to know that there are more interesting things one can offer than a flat stomach." Despite holding the "dream job" for many, she said in a statement earlier this year that her decision to leave was motivated by a simple desire to find her identity outside of Vogue. "It has been very hard to find a rational reason to leave what is unquestionably a fascinating and rewarding role but last autumn I realised that I very much wanted to experience a different life and look forward to a future separate to Vogue," she explained in a statement. "Although I have had months to acclimatise to the idea of leaving Vogue, it hasn’t made the moment of announcing this any less sad. I have been incredibly privileged to have been able to look after such a great magazine for so long and even more to have worked with so many people over those years who have made the experience so interesting and rich." "It was difficult to decide to leave but 25 years is a very long time and I am tremendously excited that I will now look forward into a different future," Shulman added, "but I know that nothing will be quite like the years I have spent at Vogue."